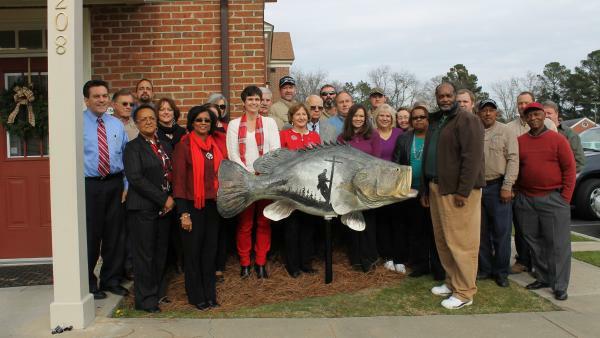 The most recent fish to be added is located in front of the Halifax Electric Membership Corporation office in the Town of Enfield, which means that there is now a fish located in each incorporated municipality in Halifax County. The electric cooperatives fish was painted by artist Napolean Hill as a realistic striped bass (or rockfish) with the silhouette of an electric cooperative lineman hard at work to bring electricity to the rural areas of North Carolina. North Carolina’s Electric Membership Corporation provides reliable, safe and affordable energy and related services to more than 950,000 households and businesses in 93 of North Carolina’s 100 counties. Each of NCEMC’s 26 electric cooperatives is member-owned, not-for-profit and overseen by a board of directors elected by the membership. Together, these organizations serve more than 2.5 million North Carolinians with reliable, safe and affordable electricity. For over seventy years Halifax Electric Membership Corporation (Halifax EMC) has been providing service to Halifax, Warren, Nash and Martin Counties.